The ball has not been tipped (yet), but here we are. The NCAA Tournament field is set and there are plenty of emotions that a lot of people are probably going through now. The teams they dislike somehow got in while the teams that are near and dear to their hearts somehow got snubbed. Their coworkers, friends and family who got their education in a Power 5 conference are talking about their respective school’s chances while they—a person who went to a non-basketball school—are either left convincing themselves that the NIT will be worth watching this year, or trying to find the will to support some random group of college students with a shithead coach that embodies everything that’s wrong with the NCAA’s current model. Some might even be coming to the realization that the school their ex went to has a good chance of winning the whole damn thing. It truly does seem this is a hard time of year for a lot of people online and I just want to acknowledge that your anger is valid. For the rest of the population that will still be watching this tournament despite their team’s propensity to choke in big situations (Go Terps! ), the number one seeds are Duke, Virginia, Gonzaga and North Carolina. The last four in were Belmont, Temple, Arizona State and St. John’s while the first four out were UNC Greensboro, Alabama, TCU and Indiana. Most importantly, Gardner-Webb is in the UMBC memorial No. 16-seed that faces off against No. 1 Virginia in the first round. 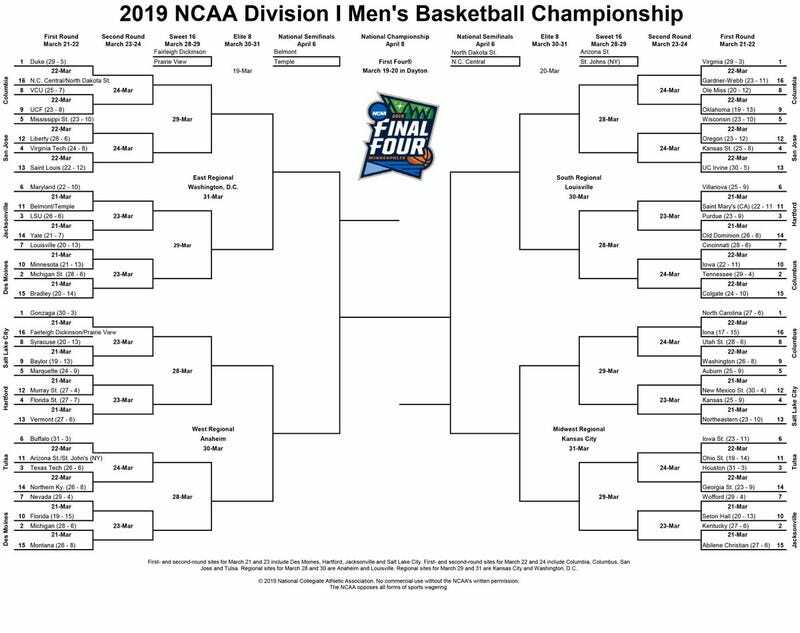 There aren’t as many notable snubs this year as there have been in previous iterations of this tournament, but one thing that many angry people on Twitter noted was that it seems like that the selection committee didn’t really touch the NCAA Evaluation Tool (NET) at all. Remember NET? It’s the metric that’s replaced the hated RPI. It was supposed to change the selection process so that smaller schools wouldn’t get screwed as often as they used to compared to larger programs. But it’s pretty that this new system is just as stupid as the old one. There are other notable examples too. Seton Hall, for example, got in despite losing to DePaul twice(!) and ending the year with 13 losses. UNC Greensboro, on the other hand, was one of the first four schools out and ended the year with a 15-3 conference record and no bad losses. At least the transition from one broken system to another has been consistent! Anyways, commence your bitching, and put in your Final Four picks, down below.